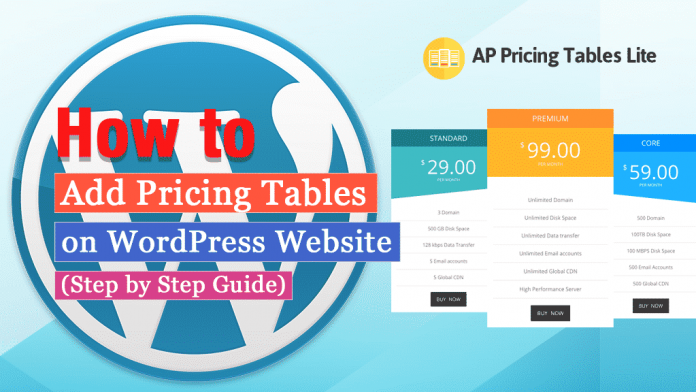 Do you want to add pricing tables on WordPress website? They allow you to display all the features and pricing plans for your products/services in an effective comparison table. By doing so, your potential clients can easily compare the different features of your services and select the right pricing plans which in turn can persuade them to make a purchase. Pricing tables, being an effective tool to boost the conversion rate of a WordPress website comes inbuilt on various premium WordPress themes. However, there are still many WordPress templates that do not have inbuilt pricing table features. If you are the user to such template then, you can add this functionality on your WordPress website by using the WordPress pricing tables plugins available. These plugins come with different features and customization options to add beautiful pricing tables without using any codes. Moreover, most of the plugins contain inbuilt shortcode generator for adding the pricing table anywhere on your WordPress website. Here, in this article, we will be using one of such type plugin – AP Pricing Table Lite (a WordPress pricing table plugin with inbuilt shortcode generator) to show you how to add pricing tables on WordPress website. Download AP Pricing Tables Lite from WordPress.org. Then, install it on your website. If you have any issue regarding the installation of the plugin then, refer to its documentation or go through the article: How to install a new plugin in WordPress website? After you have installed the plugin, activate it. Then, you will see “AP Pricing Tables Lite” appear on the left menu of your WordPress dashboard. Click on it. You will land to the main page (“AP Pricing Tables Lite” page) of the plugin. It contains all the pricing tables you have created to date. To add a new pricing table for your WordPress website Click on “Add New Table” button. Here, you need to set the name of your pricing table. 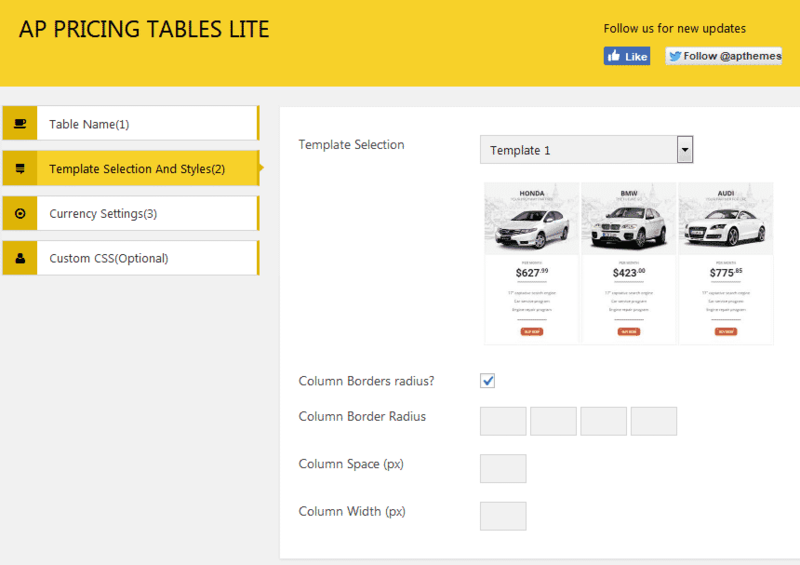 Here, you can select any of the 5 pre-designed templates for your pricing table. Also, you can enable and add the column border radius and set the column space and column width. Here, you can select the currency that you want to display on the pricing table. Also, you can choose the currency position and set thousand separator, decimal seperator, and number of decimal. 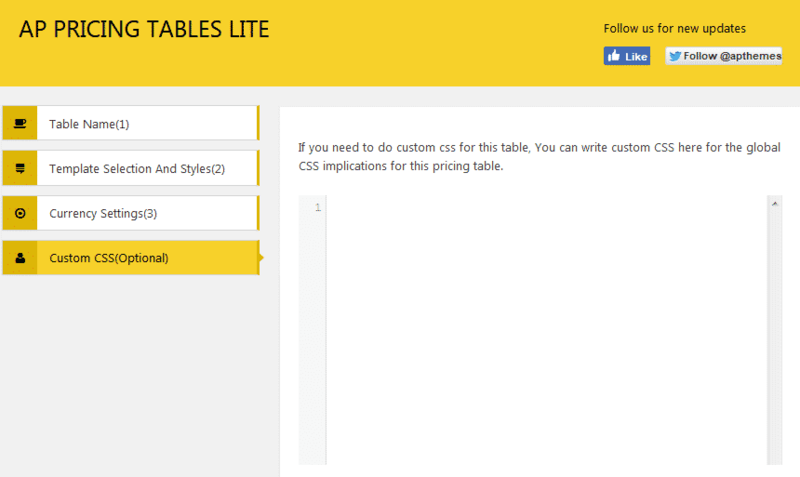 Here, you can add the custom CSS codes if you want to add anything on your pricing tables. Then, go to the column editor below to add columns for your pricing table. You can add upto 4 columns. If you want the feature to add unlimited column for your pricing table then, you can upgrade the plugin to its premium version – AP Pricing Table at a reasonable price of $17. 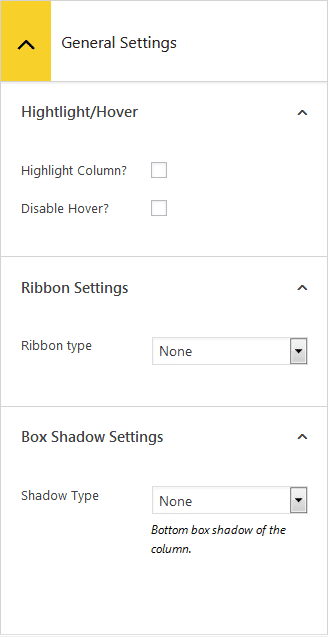 Here, you can enable/disable hover/highlights, choose ribbons and box shadow. 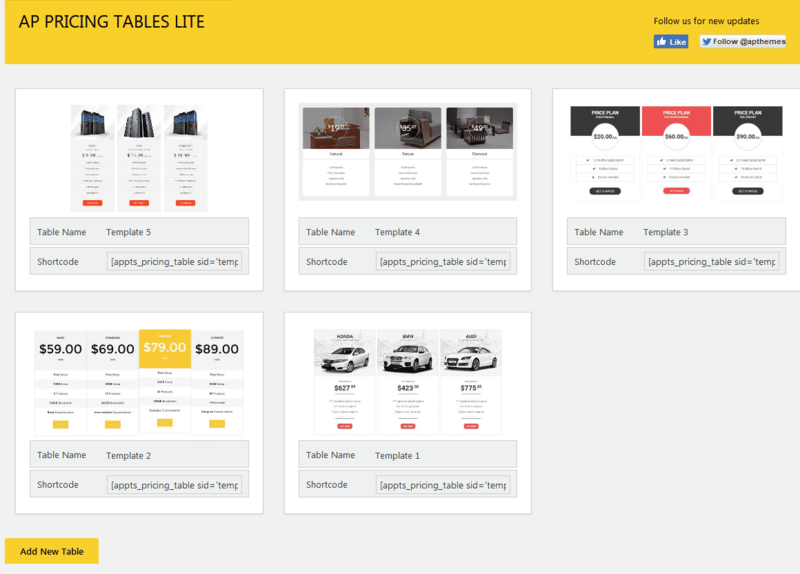 Here, you can insert the featured items, title and subtitles and price on the table header. Here, you can add the rows on the body part of the table. The plugin allows you to add upto 4 rows. For the feature to add more rows, you can upgrade the plugin to its premium version – AP Pricing Table at a reasonable price of $17. Each row will let you add custom text or button. Here, you can add the rows on the footer of the table. The plugin allows you to add upto 4 rows. For the feature to add more rows, you can upgrade the plugin to its premium version – AP Pricing Table at a reasonable price of $17. After you have done configuring your table. Click on “Save” button. Then, a unique shortcode will be automatically generated. Copy that shortcode and paste it on any page, post or custom post types to display your pricing table. In this way, you can add pricing tables on WordPress website in a few minutes. The pricing tables are very important element for websites that sells products/services to let your visitors know about the different pricing plans. So, if you want to add pricing tables on your WordPress website quickly and easily then, you can use the above-mentioned plugin for free and follow the tutorial. 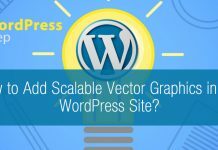 Previous articleHow to Fix the WordPress Website Not Updating Right Away?